Title - Application title that will be shown in the toolbar. 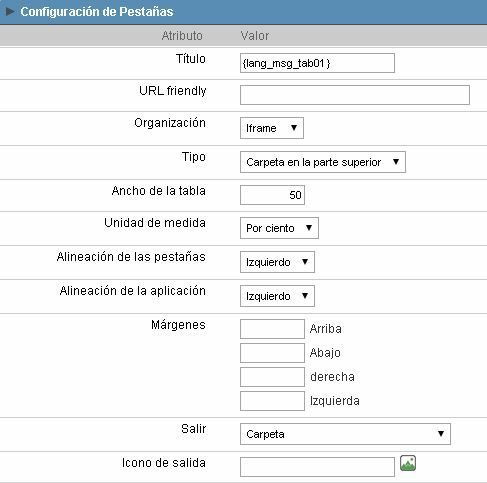 Organization - Allow that the application run in the folders through an iframe or normal. Folder above - Display the folders above the application. Folder below - Display the folders below the application, next to the footer. Folder in the left - Align the folders in the left, like a vertical menu. Folder in the right - Align the folders in the right. Menu above - Have the same principle of 'Folder above', but its visual schema has the menu style. Menu below - Have the same principle of 'Folder below', but its visual schema has the menu style. Menu in the left - Have the same principle of 'Folder in the left', but its visual schema has the menu style. Menu in the right - Have the same principle of 'Folder in the right', but its visual schema has the menu style. Side by Side - Show all applications in folders order, one next other. Table size - Size of the main table. Measurement Unit - The unit used by table size. Can be: Pixel or percentage. Tab Alignment - Define the tab position. Can be: center, left or right. Application Alignment - Define the application position, Can be: center, left, or right. Exit Icon - You can define the icon of the exit button on the toolbar. Use the image selection resource to visualize and select in easy way the desired image.